I’ve not been one to jump on the Malcolm Gladwell bandwagon; I can’t quite get past the disconcerting hair. That said, his recent piece in The New Yorker, “Small Change: Why the revolution will not be tweeted,” makes a compelling case for the limits of social media when it comes to generating social action. Gladwell frames his piece as a study in contrasts. 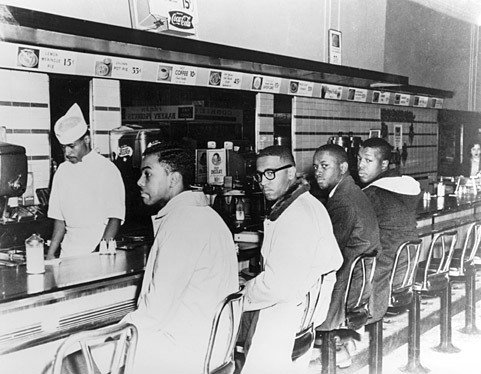 He begins by recounting the evolution of the 1960 sit-in movement that began when four freshmen from North Carolina A & T sat down and ordered coffee at the lunch counter of the local Woolworth’s and refused to move when the waitress insisted, “We don’t serve Negroes here.” Within days the protest grew and spread across state lines and tensions mounted. Some seventy thousand students eventually took part. Thousands were arrested and untold thousands more radicalized. These events in the early sixties became a civil-rights war that engulfed the South for the rest of the decade—and it happened without e-mail, texting, Facebook, or Twitter.
. . . Within days of arriving in Mississippi, three [Freedom Summer Project] volunteers—Michael Schwerner, James Chaney, and Andrew Goodman—were kidnapped and killed, and, during the rest of the summer, thirty-seven black churches were set on fire and dozens of safe houses were bombed; volunteers were beaten, shot at, arrested, and trailed by pickup trucks full of armed men. A quarter of those in the program dropped out. Activism that challenges the status quo—that attacks deeply rooted problems—is not for the faint of heart. “All of the applicants—participants and withdrawals alike—emerge as highly committed, articulate supporters of the goals and values of the summer program,” he concluded. What mattered more was an applicant’s degree of personal connection to the civil-rights movement . . . . [P]articipants were far more likely than dropouts to have close friends who were also going to Mississippi. High-risk activism, McAdam concluded, is a “strong-tie” phenomenon. Gladwell also goes on to explain why hierarchy, another feature typically absent from social media activism, is indispensable to successful movements while taking some shots along the way at Clay Shirky’s much more optimistic view of social media outlined in Here Comes Everybody: The Power of Organizing Without Organizations .
. . . I would quibble with Gladwell’s wholesale rejection of weak ties as a means of building a social movement. (I have some issues with Shirky, too.) It turns out that such distant relationships aren’t just useful for getting jobs or spreading trends or sharing information. According to Granovetter, they might also help us fight back against the Man, or at least the redevelopment agency. Read the whole post to get the full argument and definitely read Lehrer’s excellent review of Shirky’s book linked in the quotation above. Essentially Lehrer is offering a kind of middle ground between Shirky and Gladwell. Since I tend toward mediating positions myself, I think he makes a valid point; but I do lean toward Gladwell’s end of the spectrum nonetheless.
. . . is actualized only where word and deed have not parted company, where words are not empty and deeds not brutal, where words are not used to veil intentions but to disclose realities, and deeds are not used to violate and destroy but to establish relations and create new realities. Arendt made that claim in the late 1950’s and she argued that even then words and deeds had been drifting apart for some time. I suspect that since then the chasm has yawned ever wider and that social media participates in and reinforces that disjunction. It would be unfair, however, to single out social media since the problem extends to most forms of public discourse, of which social media is but one example. It is hardly an exaggeration to say that the very point of ‘public reason’ is to keep the public discourse shallow – to keep it from drowning in the perilous depths of questions about ‘the nature of the universe,’ or ‘the end and object of life,’ or other tenets of our comprehensive doctrines.
. . . the new massive distribution of desituated information was making every sort of information immediately available to anyone, thereby producing a desituated, detached spectator. Thus, the new power of the press to disseminate information to everyone in a nation led its readers to transcend their local, personal involvement . . . . Kierkegaard saw that the public sphere was destined to become a detached world in which everyone had an opinion about and commented on all public matters without needing any first-hand experience and without having or wanting any responsibility. Here men are demoralized in the shortest possible time on the largest possible scale, at the cheapest possible price. I’ll let you decide whether or not that motto may be applied even more aptly to existing media conditions. 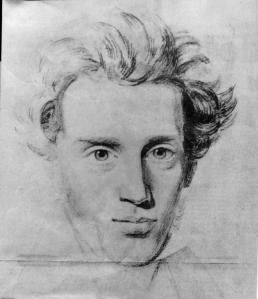 In any case, the situation Kierkegaard believed was created by the daily print press in his own day is at least a more likely possibility today. A globally connected communications environment geared toward creating a constant, instantaneous, and indiscriminate flow of information, together with the assumptions of public discourse described by Smith, numbs us into docile indifference — an indifference social media may be powerless to overthrow, particularly when the stakes are high. We are offered instead the illusion of action and involvement, the sense of participation in the debate. But there is no meaningful debate, and by next week the issue, whatever the issue is, will still be there, and we’ll be busy discussing the next thing. Meanwhile action walks further down a lonely path, long since parted from words. I have to tell you, Michael, you are one of the best writers I’ve never heard of before. Please take it as a compliment. Many thanks, Tom. I’ll take it as one of the better compliments I’ve been paid! I love that you brought Kierkegaard into this. Well done. I’d been struck by Kierkegaard’s insights on the “press” since I first encountered them in Dreyfus’ book, and they came to mind again as I began writing this post. Take a look at Dreyfus’ book if you ever get a chance. It’s slightly dated now, but still offers a number of valuable insights.